I was waiting for my appointment with a chiropracter. Suddenly a woman was yelling: Help me!!. Water from the water machine was flooding all over the floor. She tried to stop the water without any succes. I tried to help, but could not find a button to stop the water. Finally (after 10 seconds or something) I found the power button and was able to turn off the machine. An additional paper is placed on the machine. 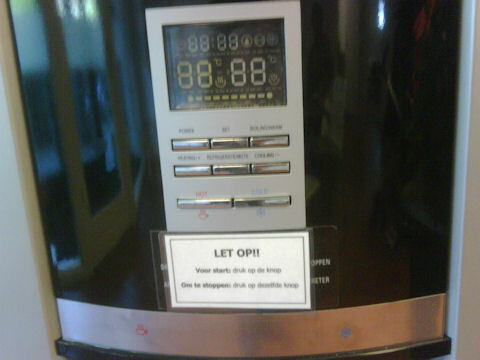 It says: “for start, push the button. For stop: push the same button”. Apart from the additional message written by the chiropracter the machine does not indicate how it works. If you push a button (Why does a water machine need 8 buttons?) the water starts flooding. You need to push the same button again to stop the water. Some individuals with back problems will hold the button in the pushed-in position, just because other machines they are familiar with work that way. Other individuals with back pain will push the button and expect that the machine will stop once the cup is fully filled. If the water doesn’t stop you have to find out very quickly how to stop the water from running. The last thing you think of as a solution is pushing the button that was causing the problem again. The main question is: who will clean the floor as all clients suffer from backpain.